Paths and anchor points are non-printing elements of the image. 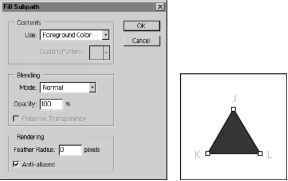 Because the black lines you see on screen as you draw with the pen tool are paths—not strokes—they do not represent any pixels in the image. When you deselect a path, the anchor points and path are hidden. You can make a path visible in your printed image by painting the stroke, which adds pixels to the image. Stroking paints color along the path. Filling paints the interior of a closed path by filling it with color, an image, or a pattern. To stroke or fill a path, you must first select it. 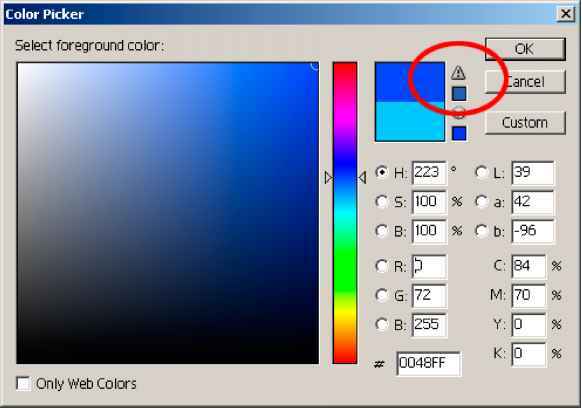 1 Click the Swatches palette tab to bring the palette forward. Click any swatch (except white) to select a foreground color to use to paint the path. 2 Select the direct selection tool (>) and click to select the zigzag line in the image window. 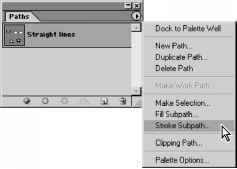 3 On the Paths palette menu, choose Stroke Subpath to open the Stroke Subpath dialog box. 4 For Tool, select Brush from the pop-up menu, and click OK. The path is stroked with the current brush settings. Note: You can select a painting tool and set attributes before you select the tool in the Stroke Subpath dialog box. Now you'll fill one of the paths. 5 Click the triangular closed path with the direct selection tool. Then choose Fill Subpath from the Paths palette menu. The Fill Subpath dialog box appears. 6 In the Fill Subpath dialog box, click OK to accept the defaults. The triangular path is filled with the foreground color. 7 To hide the paths, click the empty area below the path names in the Paths palette. 8 Choose File > Close, and don't save changes.